WAIST HIGH: The Go-Go's Announce Farewell Tour. 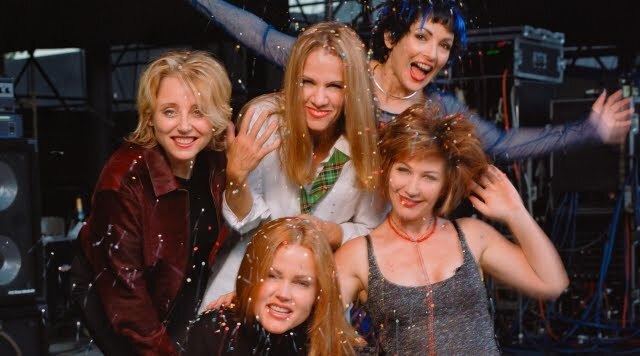 The Go-Go's Announce Farewell Tour. April 27, 2010 (LOS ANGELES, CA) - After 30 years together and a slew of chart-topping songs that defined an era, the Go-Go's announce Happily Ever After - The Farewell Tour. Happily Ever After kicks off July 7, 2010 at Lilith Fair in San Diego, wraps up July 27 in Austin, and will include a live television performance on Good Morning America, July 16 in New York City. Their story truly is a punk version of the American Dream. They came, they saw and they conquered the charts and airwaves with their kicky kitsch and sparkling California appeal. Their smash hits, such as "We Got the Beat," "Vacation," "Head Over Heels," and the aforementioned "Our Lips Are Sealed," along with countless magazine covers, television performances, and high-profile concert tours, turned Belinda Carlisle, Jane Wiedlin, Charlotte Caffey, Gina Schock and Kathy Valentine into certified rock stars, and five feisty role models for generations of ready-to-rock girls. From their halcyon days as America's sweethearts to their current status as superstars who pioneered a genre, the Go-Go's preside over an amazing three-decade reign as high priestesses of pop. Today, with the original lineup intact, the Go-Go's live show continues to deliver every bit of the raw energy of their now-legendary punk beginnings, tempered with the wisdom of three decades of pop perfection. Don’t miss them on this farewell tour as they celebrate with, and say goodbye to, their devoted fans, before the Go-Go's head into the happily ever after.